you also get flexibility - like a black replacement bezel for matching the drive to black colored PCs. A comprehensive Nero® 7 software suite rounds out the product, giving you a DVD burner like no other! Double/Dual Layer discs are capable of storing up to 4 hours of MPEG-2 video or up to 8.5GB of data on a single sided disc with 2 recordable layers. Once recorded, DVD+R DL discs are compatible with most home DVD players and DVD-ROM drives. Of course, the DRU-820A can also record standard 4.7GB DVD+R and DVD+RW discs and CDs too! The DRU-835A includes a black colored replacement front bezel for matching the drive to popular black colored PCs and comes bundled with award winning Nero™ software suite so all your burning projects will turn out perfectly! Now burning your home movies, digital pictures, music, and data onto DVD & CD is faster and more convenient than ever. Internal EIDE/ATAPI interface drive is easy to install and can take the place of an existing CD-RW or CD-ROM/DVD-ROM drive. What hasn’t changed is legendary Sony quality and reliability, and our worry free technical support if you need assistance. Choose the brand that invented dual format burners, and still does it best. 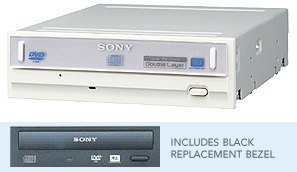 When making your purchase decision, consider the merits of Sony's award winning Dual Format, Double/Dual Layer drives or for the latest advances in DVD technology, check out Sony’s DRU-835A drives for PC-attached DVD burning, or the exciting DVDirect™ hybrid DVD recorder capable of burning DVDs directly from a camcorder/VCR, no computer required! Experience - The 800 series is Sony's 12th generation dual format burner. Sony was the first company to deliver Dual Format and Double Layer DVD burners, so you can be sure that you’re buying the best performing, most compatible burner on the market. Performance – The new 800 series drives are the highest performance Dual Format, Double/Dual Layer burners you can buy. 16X maximum burn speeds will burn a full 4.7GB disc in about 6 minutes. Software Bundle – Enjoy award winning bundled software including Ahead’s Nero Express,, NeroVision™ Express, InCD, Nero Showtime™, Nero BackitUp™, and more. Flexibility – Choose from the easy to install internal drives or ultra stylish external drives with flexible connection options. Both can burn at 18X max and are compatible with standard 4.7GB DVD+R and DVD+RW discs and 8.5GB Double/Dual Layer DVD+R discs and CDs too. Have lots of video on camcorder tapes that you would like to transfer to DVD but don’t want to use a computer? Try Sony’s exciting new Sony VRDMC5 DVDirect DVD Recorder hybrid DVD recorder. Burn directly from a camcorder/VCR to DVD, no computer required! Burns 8.5GB DVD±R Double/Dual Layer discs at 18X max, capable of burning a full disc in about 5 minutes. Burns 8.5GB DVD±R Double/Dual discs up to 8X max. Double/Dual Layer discs capable of storing up to 4 hours of MPEG-2 Video on single sided disc with 2 recording layers. Recorded DVD±R Double/Dual layer discs compatible with most consumer DVD players and DVD-ROM drives. Burns standard 4.7GB DVD±R and DVD±RW Discs and CD-R/RW too - One drive does it all!